Neil Lennon admits John McGinn has had his head turned by the recent interest in him from Celtic. 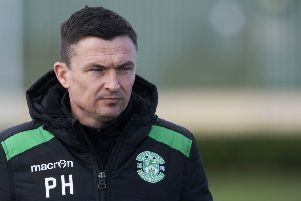 The Scotland international has been the subject of two bids from the champions, both of which have been rejected by Hibernian. McGinn was absent from the squad as Lennon’s side kicked off their Europa League qualifying campaign with a 6-1 rout of NSI Runavik at Easter Road, sparking concern that he was on his way out of the club. Lennon insisted after the game that his key midfielder was absent through injury, but admitted he was not in the right frame of mind to play. “His thigh was heavily strapped yesterday,” Lennon explained. “I know there will be a lot of conspiracy theories flying about, which is fine, but I am in control of this. “I had a chat with John and it puffed up a bit last night and he slept on it. He wasn’t 100 per cent, and he is not 100 per cent mentally either, and if John is to go I need to look at what else I have got.